My cherry tomatoes finally ripened (the end of Sept!!) 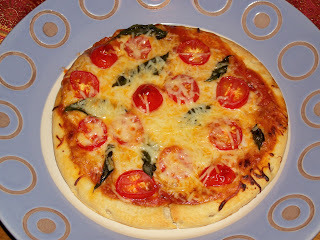 and my basil was also really taking off, so I thought I would make margherita pizza! It was delish, and I was so proud I used ingredients I was able to grow! Brush EVOO onto ready made crust (especially on the edges). Spoon on pizza crust, layer with shredded mozzarella cheese, add tomatoes (I slided them into tiny slices), basil leaves and top with fresh shredded parmesan cheese. Bake according to directions on pizza crust package (I baked mine at 415 for 15 mins. Enjoy!